What is Lead and Why is it Bad? Lead is a naturally occuring substance that can cause serious damage to developing children, pregnant women, and even adults. Lead is a metal found in nature. Lead was used for thousands of years - in bullets, pipes, construction, and paint. Eventually, people learned that lead is dangerous if it gets into our bodies. Lead is sneaky. Your body may confuse lead for calcium and absorb it in all the places where calcium should go. Unlike calcium, there is no useful purpose for lead in our bodies. 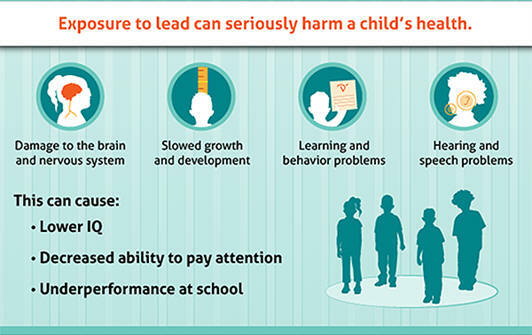 Lead is particularly bad for kids under 6 years old. Lead poisoning is 100% preventable! Talk to your child's doctor about a simple blood lead test. Contact the Lead Paint Project or the Maine Childhood Lead Poisoning Prevention Program about a free home lead dust test kit. Renovate safely. Common renovation activities like sanding and replacing windows can create hazardous lead dust. Look for contractors certified by the Environmental Protection Agency. Remove recalled toys and toy jewelry from children and get rid of them if appropriate. Stay up to date on toy recalls with the Consumer Product Safety Commission's website.